Virtual Resort Manager leads the industry with its automated accounting functionality. Back when the North Carolina Real Estate Commission did such things, it was the only software approved for both short and long term rental property management. Designed around a matrix of fully customizable accounts, reservation funds are automatically distributed each night into appropriate accounts, where the money is ready for disbursement the following morning. VRM's multiple office capability permits you to organize your business using separate offices each with independent trust accounting capability. Thus, on-site management offices can be tracked separately within the system. The user interface of the accounting system is simple and intuitive, and the requirements are straight forward and well defined. Funds disburse easily to owners, management and vendors using our unique check queue system. Reports are robust, with a complete audit trail running in the background. Access to all areas of the application, including accounting, is easily controlled on a per-employee basis using our system of permissions. The system is designed so that anyone with a basic understanding of accounting principles will be comfortable using VRM. Virtual Resort Manager is fully compliant with the requirements of the North Carolina Real Estate Commission for both short and long term properties. You can click here to view their certification, as well as the opinion of our audit consulting firm. Money flows through the Virtual Resort Manager system based on a custom designed system of user accounts. This functionality allows you the flexibility to configure your money flow to best fit the financial structure of your individual business. The hourglass illustrates this process. advance of arrival); Security Deposit (damage deposit); management (fees and commissions); and owners. As part of the installation process, your system of accounts will be configured and placed in the bottom of the hourglass. Typically, the accounts will include your various tax accounts, travel insurance, damage deposit waiver funds, housekeeping, reservation and cancellation fees, and other reservation related categories. Included, of course, will be your management commissions, and your pay-out to owners. 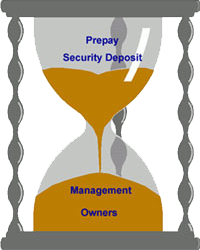 Money belonging to prepay and security deposit accounts resides in the top of the hourglass pending distribution of the reservation, which normally takes place automatically on the night of check-out. On check-out, or at earlier times designated by you, Prepay amounts automatically pass through the neck of the hourglass using a series of automated processes which take place each night at 11:20 pm. In addition to prepay, work orders which have been approved for payment, damage deposits which are ready to be refunded to the guest, and certain other items also pass through the hourglass. As a result of these processes, which are called "allocation," funds the following morning have been broken up for you and placed in the various accounts. At this point, the funds in the bottom of the hourglass are "payables" ready for disbursal. All that is necessary is for you to assign the items to a payee (vendor), and move the items to the check queue for printing. Items can be paid now, or can remain in the payables area awaiting disbursal at a later time. With Virtual Resort Manager, credit card processing is a breeze, both for on-line reservations, and in-house. VRM is fully integrated with an internet payment gateway system, Vroooompay! You choose the credit cards you wish to accept: Master Card, Visa, American Express or Discover. You are able to use your present financial institution's merchant account services for processing credit card charges, or you may opt to use services recommended by VRM. In either event, processing is quick, easy, and PCI compliant. The guest's credit card transaction can be initiated during the on-line (web) reservation process. Credit cards can also be entered directly into your system by your staff, either by keystroke, or by utilizing a keyboard card swiper. Cards that have been entered are stored in a completely secure environment tied directly to the reservation itself. Your employees do NOT have direct access to your guest's credit card numbers (as is the case with some systems), eliminating a significant potential for credit card fraud. With VRM's integration, it is possible to perform an "authorize only" transaction, to initiate a "re-issue" for additional charges which may be applied to the guest folio, or to apply charges for damages discovered after the guest checks out. Credit card numbers need only be entered once, eliminating the hassle of initiating the transaction on a point-of-sale terminal, and then transferring the information manually into the reservations system. The daily batch reports are readily accessible, making ongoing daily reconciliation with your cash receipts report and deposit worksheet a simple process. Transactions generated for the various credit card types are clearly accounted for, as are transactions generated through on-line booking. Virtual Resort Manager handles this important profit center with ease. Travel Guard, Rental Guardian, Red Sky and CSA Travel Protection are all fully integrated in the VRM system. Third party and self-insured Damage waiver options are also supported. Travel insurance and damage waiver options can be either opt-in or opt out programs and are also a fully functional guest option in the on-line web reservations process. The VRM system has integrated with CSA Travel Protection providing real time travel insurance data updates. The VRM system automatically notifies CSA when changes to reservations are applied resulting in the reservation's travel insurance coverage to change. This includes but is not limited to changing of a reservation's check in or checkout dates, canceling a reservation, or altering a reservation's rental amount. VRM tracks all travel insurance sales and subsequent declines, and provides full reporting, making monthly settlement with the travel insurance vendor quick and easy. The vendor check is generated directly through the VRM system, eliminating multi-step processing. Virtual Resort Manager provides the needed functionality to process Security Deposit Waiver fees, either through the in-house management console, or on bookings created on line through the web. SDW fees can be defaulted to the reservation, or can be added as an extra charge. We also provide the means for the guest to decline the SDW fee, in which case the reservation charges automatically recalculate to reflect the change. The system provides all of the necessary reports to comply with the requirements of the various providers, and properly splits commissions and fees. It also processes the vendor checks for payment. For those jurisdictions which provide for SDW to be processed as an in-house fee, the system reserves collected funds in a separate account for later disbursement. Damage waivers can be setup within the VRM system to either be supported by the vacation rental management company (Self Insured) or by a travel insurance company. Virtual Resort Manager fully supports electronic funds transfer (EFT) for both your owners and your vendors. Using this technology, you are able to forward payment electronically to the banks accounts of those owners and vendors who wish this service, thereby eliminating the extra steps and expense of processing and mailing paper checks. The ACH file generated from the VRM applications adheres to all NACHA requirements. The process is integrated in VRM, and is simple to handle. Owners and vendors who wish to be paid this way are flagged in the system, and VRM prepares the files for submission to your financial institution. Virtual Resort Manager provides full functionality to provide your owners with their required 1099s. In the event that your business is required to file electronically, this requirement is also fully supported. Clients who convert to VRM during mid-year are provided with a simple wizard which permits 1099 information from their previous software system to be brought forward, eliminating the need for multiple forms and filings. VRM also provides documentation of owner costs associated with each rental property according to the IRS expense categories, making their annual trip to their tax preparer easier and less costly. The Virtual Resort Manager system provides full functionality for managing both sales taxes and local/county/state room taxes. Taxes are calculated individually by reservation and transaction, assuring accurate calculation. The built-in reporting functions conveniently break taxes down by tax type and by the jurisdiction to which the tax is due, and the system creates appropriate checks for each, making settlement a quick and simple matter. All you do is run the reports, transfer the information to any official forms you are required to file, print the checks and put the package in the mail. 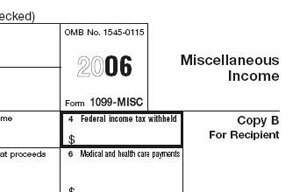 VRM also automatically manages many special taxes, such as the Gatlinburg Owners Gross Receipts Tax and the Hawaii Gross Excise Tax. Prompt payment discounts calculated as a percentage of tax due are also fully supported, as are taxes with special time limitations, such as those found in Georgia. Future tax rate changes can also be entered in the system, and are correctly calculated for the appropriate future reservations. The system permits application of the appropriate sales/room taxes on appropriate charges and fees down to the individual property level, making it a simple matter for clients operating in multiple jurisdictions to accurately track taxes.